WiFi pairing is like the paring process to get a mobile phone to pair with your car using Bluetooth. A camera can pair with multiple different networks and devices, and store them. It will only operate with one device at a time. 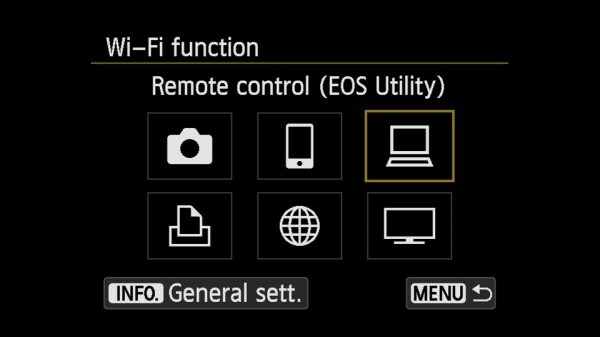 WiFi pairing is initiated on the camera LCD menu, you need to choose EOS Utility as the type of connection, then follow the steps on the camera menu to configure the network settings. Near the end of the process the camera prompts you to start the pairing software on your computer, this is your cue to run EOS Utility. 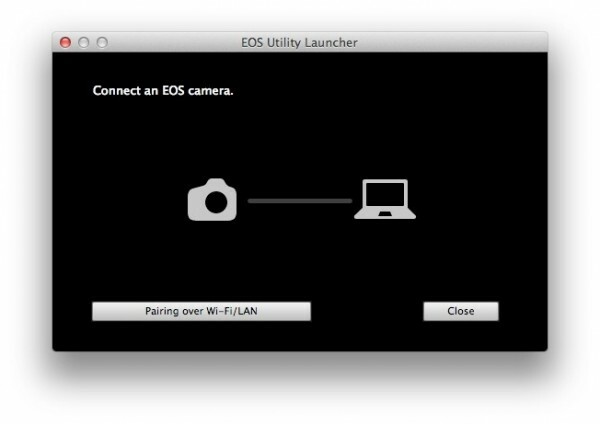 With the release of EOS Utility 2.14 and EOS Utility 3.0 Canon have changed the process for WiFi pairing your EOS camera with your computer. Canon has added an EOS Utility Launcher that will start if you try to run EOS Utility when no cameras are connected to the computer with USB. The software assumes that no connected cameras means that you will connect a camera with WiFi. Click the Pairing over WiFi / LAN button to show any cameras that are detected on your network as part of the WiFi pairing setup on the camera. This will display the dialog box so that you can select your camera on the network. Detected cameras on the network will be shown, and you select the correct camera and click connect. The computer displays a message to ask you to check the instructions on the camera LCD. The camera display will change and you can save the settings for later recall. In reality the process of WiFi pairing EOS cameras using EOS Utility 3.0 and EOS Utility 2.14 is the same for now. Some time ago I wrote a post about tethering the EOS 6D to Lightroom. I then needed to update it to explain how the EOS 70D could be tethered to Lightroom 5.x too. Thanks to a question from Ashley Bee in the comments of the later article I wrote this post. Don’t forget that you can download the updates to your Canon EOS Utility directly from Canon’s website, plus if you don’t have an CD-ROM drive in your machine you can even download the whole EOS Solution Disk which can then be updated using future updates. Can you explain why EOS Utilities insists that I pair my Canon 7d to a LAN/Wifi network? I do not use my camera as a network device. It has no Wifi card and I do not have a LAN to connect to. Thanks for the question. In the recent editions of EOS Utility there’s the new EOS Utility launcher, this is what pops up the WiFi pairing message seen above. It pops up every time you try and start EOS Utility with no EOS camera connected on USB. Have you tried connecting your camera with USB to the computer, usually it should start EOS Utility and bypass the pairing screen. Hi Brian, do you know if it is possible to control the camera from a laptop via wifi when connected directly without a separate wireless access point as you would with a mobile device and app. I have a windows 8 tablet (no app available) and I would like to use this for controlling the camera when taking shots outside. I can setup the camera as a wifi hotspot and join the cameras wifi network from the tablet/laptop. I can also ping the ip of the camera from the tablet/laptop so communication is working. But when pairing it finds no camera and when opening the app the control options are grayed out. I am running the latest version of software. This is the single most interesting question here, yet it seems to be the only one not answered by the author of the article. @Keith: Have you worked it out? Or does anyone else have an answer? I would really apreciate it. Yes you can control the camera from a laptop via WiFi without using an access point. The camera effectively becomes the access point for the laptop. You need to choose camera access point mode for the communications. However not all the cameras with WiFi are enabled to work over Wifi with EOS Utility. The EOS 750D / EOS 760D can only connect to iOS or Android devices over WiFi. EOS 70D, EOS 80D and EOS 6D can all connect to EOS Utility on Windows/Mac using Wifi and no access point. There’s no app for Windows 8 tablets. Specifications say it is 30m, but like all WiFi devices a whole set of factors will reduce this and few increase it. Indoors the walls, big bits of metal and the presence of large bodies of water like fish tanks all reduce the range. You might get more than 30m outside in open space. That is the issue that I am having, no laptop icon on the 750D. Pity its not much bother to connect the USB, but why exclude the 750D it seems so petty minded! I think you are mistaken. I have successfully connected several different camera models to a laptop with EOS Utility using a Wi-Fi connection and no other access point operating. There are two possible ways to connect, the camera can create a Wi-fi hotspot itself that you connect the laptop to, or you can use an existing Wi-Fi network hotspot and connect both camera and computer to that. The only odd issue with the camera creating the hotspot, is that when you turn the camera off, the laptop usually starts hunting for another network, and if it finds something, then it stays with that new one, not the camera one. Hope this straightens things out for you? I’m having a hard time with the raw transfering via wifi. I wish i could turn off the raw transfer and transfer only the jpgs, leaving the raw ind card. This was easy to do at the utility’s older version (pre ios yosemite), but now i can’t find where to do so! can you enlighten me in this matter? Sorry i’m not yet running Yosemite on my Mac, but will be shortly. However if your camera uses EOS Utility 3.x then the process is different from EOS Utility 2.x. 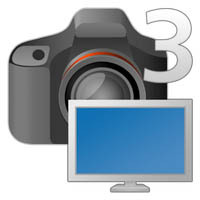 In short click on the file location button in the remote shooting window where he computer and camera icons are. Then you can choose which files go where. It looks to me that Canon has limited the camera Wifi settings on a 750D. The option ‘EOS Utility’ is not available on the 750D and as far as I’m concerned, that should be the default pairing option. So, getting the photos from the camera onto your computer, one has to use the USB cable. I hear you and to be honest I was also pretty surprised when I found they had limited the WiFi to only allow communications with a smart phone or tablet and not a computer. Simple question I can’t find an answer to your help would be appreciated. Have a Canon 6D that I want to connect to my laptop. I am in the camera menu to this. It asks me to enter ASCII characters – what are these characters? I use a Windows 10 laptop. To me this sounds like you are in the menu to enter the WiFi password, the screen asks for ASCII characters. The characters you need to enter will depend on whether you are connecting to an existing WiFi network, then the ASCII characters, sometime labelled as the WiFi password or key may be on the WiFi router itself. Or if you are connecting directly to the laptop and there is no WiFi router or network around then you can make up the ASCII keys, they are the password you need to be able to connect your laptop to the network created by the camera. You will then enter these ASCII characters as the WiFi password on the computer or smartphone. i recently bought a camera Canon EOS 1200d and i don t know how to download my pictures from it because when i connect my camera via USB it doesn t connect and with the eos launcher it require a wi-fi and i don t have a card with wi-fi and i think i don t want to buy one because its too expansive and i think it s not worth it! Do i have any other options to download my files? EOS Launcher should detect the camera is connected with a USB cable and just start EOS Utility. You don’t need to buy a WiFi card for the camera – in fact the EyeFi cards won’t work with EOS Utility. If you just want to download the files, then a card reader – probably built-in to your computer – is faster than using a cable. In the Applications > Canon Utilities > EOS Utility folder there should be an app called EOS Utility, this is the launcher. There are two further subfolders on my system, one each for EOS Utility 2 and EOS Utility 3. In the wifi menu on the EOS 760D I cannot see an option for EOS utility. Only for: camera to camera, smartphone, printer, web service and dlna device? That’s correct – it is not possible to use the WiFi to connect an EOS 750D or EOS 760D to EOS Utility, only a USB cable. I was a little surprised when I first saw that. Unfortunately it appears to be a decision made somewhere in Canon to restrict this capability. How to stop the EOS Utility Launcher from popping up every time I start my computer without smothering the automatic start up of EOS Utility 2 when connecting a camera with a USB cable ? EOS Utility is in the computer start up list. I have no WiFi on my 5DII so the launcher is of no walue at time beeing, but even if I get another camera with WiFi, I see no point in launching this “launcher” at every start up. Basically the EOS Utility Launcher is what is “kicked in to action” when the camera connects. It then decides if the camera can use EOS Utility 3 or 2 or if WiFi pairing needs to be done. On my mac I tend to specifically select the application I want to start in the ImageCapture utility that’s part of the OS. I change it from the default Launcher to the specific version of EOS Utility for the camera, it just speeds things up a little. You can do something similar in Windows by choosing the default program that’s started when the camera is connected. I take photos using a Canon T5 and download them via USB cable to a Windows tablet running Canon EOS software. The images are processed and uploaded to a server using WiFi. I would like to eliminate the USB cable. I have been searching for a way to transmit images to a Windows tablet using Bluetooth so the tablets WiFi can remain connected to a local network. Can you tell me how to enter the wifi password on my Canon EOS M3 camera. i use a wifi router and a desktop pc with win xp/pro updated. my 6d it seems to make a coonection to my local net but eos utility does not finding any camera. any ideas please? This sounds like a firewall issue. You may need to temporarily disable the firewall on your computer, then see if the connection with WiFi works. If the connection works you’ll need to open up the firewall for the camera connection / ports. the pairing doesn t work. Hi, I have the EOS 1300D I have the EOS app loaded to my MacBook Air, but when I connect via USB it doesn’t start up or recognise my camera. It doesn’t seem to see it via wifi either? hi! i have a canon EOS rebel t6 and i would like to find a way to transfer videos off of my camera on to my smartphone. The app only lets you save pictures. I downloaded EOS utility however when i go to wifi function i only have two options, connect to smartphone or upload to web service. How do i make this work? Is there any other way i can save videos to my smartphone? It is urgent, thanks. It’s not readily possible to transfer videos from the camera to your smartphone directly. Pretty much the best option is copy the video files off the camera card to a computer and then transfer them to the phone via a cable, email, dropbox, or maybe another microSD card if your phone has a suitable slot. EOS utility will let you transfer the movies to your computer over WiFi, but it’s faster with a USB cable or putting the camera card in the laptop. Are there any ways we can use the new Canon connect mobile app for timelapse? Can we use it as an intervalometer? Are you tethering with EOS Utility or directly to Lightroom. I don’t know why your camera is dropping the connection, make sure you turn off the WiFi in the camera as this does usually switch off the USB port. I would suggest you use EOS Utility to handle the tethering, I find it drops out much less – almost never – than Lightroom. You can then use Lightroom to watch the folder that the files arrive in and auto import. my camera is canon eos750D. It not displayed that utility remote icon. Please help me to cannect pc via Wi-Fi. Sorry the EOS 750D and all the ES 760D do not support connection to EOS Utility with WiFi. For some reason Canon chose to limit this in the camera functions. I recently purchased an EOS 1300D and connecting it to my Macintosh using a wi-fi connection seems to be impossible. Is there any chance to transfer the files on the computer without using the cable at this type of camera? The manual says “yes”, but the camera refuses to collaborate. I’m not sure where you have seen that in the manual. The wifi manual says on page 2 that the only kinds of connections possible are to a smartphone/tablet, Canon connect station and if it’s available in your region the Canon Image Gateway. So that means that connecting to a Mac or PC and EOS Utility is only possible with a USB cable for the 1300D. Actually this is the same limitation as the 750D & 760D too. Hi, I wish I had found this article a couple of months ago, it would have saved me many frustrating hours trying to connect my 1300D to my laptop. I own a Canon EOS 1300D with WiFi/NFC function. Pairing over WiFi works well with my smartphone! Is it possible to do Pairing with EOS Utility over WiFi ? If yes, then how to do that? In short the answer is NOT possible without some additional hardware. I am wanting to setup a permanently tethered EOS camera for taking pictures of gemstones for the web. I am after good image quality but not resolution. What EOS models offer what controls when tethered? Are older models like 1000D limited compared to newer models or higher end models? I would like basic manual controls and focus adjustment, it would be also nice to easily review images after taking. I have just read your link above, you have just saved me from buying a camera I though I could connect via wifi. So no wifi for me as the higher end newer cameras are unfortunately out of my budget. Thankyou and any advice appreciated. Virtually all the EOS DSLRs offer tethered shooting using a USB connection. The limiting factor tends to be the operating system support for some of the older models. EOS Utility exists in two “tracks” the version 2.x and version 3.x. Most of the latest cameras use v3.x, but some of the older ones use v2.x, and few can use either. In the case of an EOS 1000D, the latest version is EOS Utility 2.14.31 for Mac OS X (10.12, 10.11 & 10.10) for example. It would be suitable. With EOS Utility you can control shutter speed, aperture, ISO, Picture Style, and if the lens has AF – not the MP-E 65mm f/2.8 1-5x Macro – then you can drive AF from the software and have live view to see what is going on. So pretty much choose the camera on the price you want, and it will be ok with a USB connection. You can use up to 5 metre USB if the cable is good quality without using any booster cables. Sorry but your T6i cannot connect with Wifi to your computer, only to a smartphone/tablet. Also, if I launch EOS Utility (which version?) and click on “Pair over WIFI” not camera is listed in the popup box. When the screen asks for the encryption key there’s initially five stars shown – ***** – you need to tap the onscreen delete key then start entering your encryption key for your network. Once you do this then the menu button will be clickable. EOS Utility v3 for EOS 80D. Camera will only be listed once you have completed the network settings on the camera body – it then prompts you to start the pairing software on the LCD, so that’s when the camera will appear. Thanks for your kind response, Brian. Does “the screen asks for the encryption key” refer to the screen on my Windows 7 computer? Without detailing all steps to accomplish this, I am able to establish a connection apparently. My EOS80D shows up as a wireless connection just like my connection to the router for the internet. However, when I launch EOS Utility Launcher I get the “Pairing over Wi-Fi/LAN” screen and clicking on the button with that name the smaller window pops up but no camera is listed. (The name of my camera appeared in that window earlier after a 10- or 15-sec. delay. However, closing and relaunching the EOS Utility Launcher does not cause the file transfer window to open, only the “Pairing over Wi-Fi/LAN” window. I seem to be stuck in a loop. Not a problem with your instructions at this point, I think. There is a step in the establish-connection process that asks me to identify a numbered set (1-3). This does not appear in Canon’s wireless connection manual, which I find to be awful. I’ll reboot and see if this helps. Brian, I uninstalled EOS Utility and reinstalled it. I got it to recognize the connection already established. Sorry but your T6 / 1300C cannot connect with Wifi to your computer, only to a smartphone/tablet. Hi Brian, I am trying to connect my Eos 5d mk iv to my windows 10 PC and laptop by wifi using Eos utility. I can connect the computers to the camera wirelessly with no problem. The issue arises over pairing. 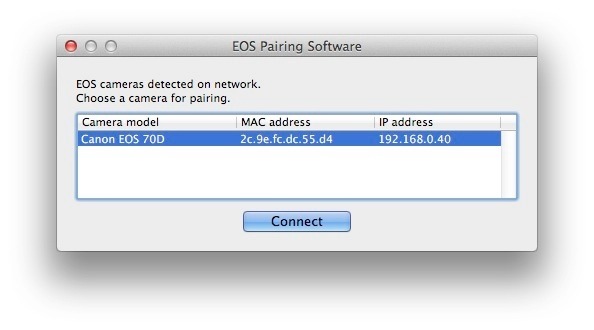 The Eos utility does not find my camera when it goes into ‘pairing over wifi/lan’. The white connect box remains empty. This happens in Easy setup and also in Select a Network connection methods. I am running Norton internet security and have tried disabling the smart firewall to no avail. I have also uninstalled and reinstalled all of the canon utilities for the mk iv from the Canon website. The camera will connect fine by USB if you go straight to the Eos Utility 3 program, but if the launcher is used, it will only try to connect wirelessly, and without success. I have also and previously used a 5d mk iii, but have updated all of the software for the mk iv. I do hope that you can help, as the wifi capability is one of the reasons that I upgraded. The solution was really simple in the end, after 4 days of trying just about everything that I could think of. Just run the Eos Utility as administrator! It worked straight away and made me feel rather foolish. Hello Brian. I have a Canon 70D and I was wandering if I can connect it to my laptop via wifi and in the process I am taking the photos, they are shown on my laptop. Is this a possibility? If yes, how do I do that? 🙂 Thank you in advance! Yes you can connect your EOS 70D to a Windows or Mac laptop with WiFi, and then you can configure EOS Utility to transfer images and display them as you shoot. I use this a lot with my own cameras for demonstrations and when working in a studio. You can ignore the step about Lightroom, once you have EOS Utility setup it can handle the transfer and display directly. Yes this is indeed the case, though the newest EOS 200D, 800D and 77D all can be used to connect to a computer with EOS Utility using the wi-if connection. I just bought the Canon Eos 200D and I’ve been trying to connect it to my macbook but it’s not working. It says that the camera can’t be found. Do you know what is going on? Maybe you can’t transfer the pics to the computer with wifi? only cable? EOS utility unsuccessfully updating my Win 10 FireWall at start and camera pairing not working… ?what to do? This happened to me when I tried to establish camera PC connectivity over WIFI. My PC is a company owned with partially restricted Admin access and Symantec EDP as antivirus. EOS utility was not able to update local FW and I was not able to proceed further with camera pairing. To make the connection working, I had to manually add TWO following FireWall entries in my Win 10 laptop. That’s great info, glad you have sorted it and shared the steps you took to get it working. I think that the key to your problem was the restricted admin account on your computer. Generally the Canon software wants to be installed as a full admin user. Thanks for your write up – just got a 5D4 specifically to be able to tether wirelessly in studio. I have connected my camera to the EOS utility in both an iPad and a MacBook pro and am able to view images in thumbnail or via the quick preview but am having ONE issue – with the quick preview I am unable to shuttle through images – in other words I can only see the last image I took. Essentially what I would like to do is see the images I shoot in large format (not thumbnail) but be able to go backwards or forwards as I could when shooting tethered into Lightroom. Please tell me there is an easy way to do this and that I’m not missing something? Much appreciated in advance! You are correct the quick preview cannot easily go back to previously taken images. There are two solutions, however. 1. Use DPP. You can use DPP to be the linked software and then each image is loaded in DPP. Now you have a browser that can go back and forth in the images. 2. Use EOS Utility and Lightroom together. Basically disable the quick review feature in EOS Utility and get Lightroom to auto import the files from the folder. 2. You should then find the canon named regs when you go to the names. 3. Run the Eos Utility in Admin mode and reinstall the wifi connection. 4. After new connection within a few minutes you will lose wifi connection! madness I know but then go to your wifi settings click on show available networks and reselect your camera. If is doesn’t work for you please do not have a go a me but vent your anger at Canon after all it’s there problem! i have a cannon eos 5d ist model which my apple yosemite mac does not support. i have tried to run a pairing protocol which requires a mac address and an ip address (which i don’t know how to find) but the screen does not even allow me to put in the camera model before i even get to those. i can use card reader to transfer images but i would like to do it direct. the camera setting communication has been changed to print. also, when the camera setting is rgb raw but when i transfer via a card reader the image becomes sRGB which is why i want to work out a direct transfer. Yes the 1300D will connect with WiFi to a smartphone or tablet, but not both at the same time. You need to use the Canon software – free to download from the iOS or Android stores – called Camera Connect, by Canon Inc.